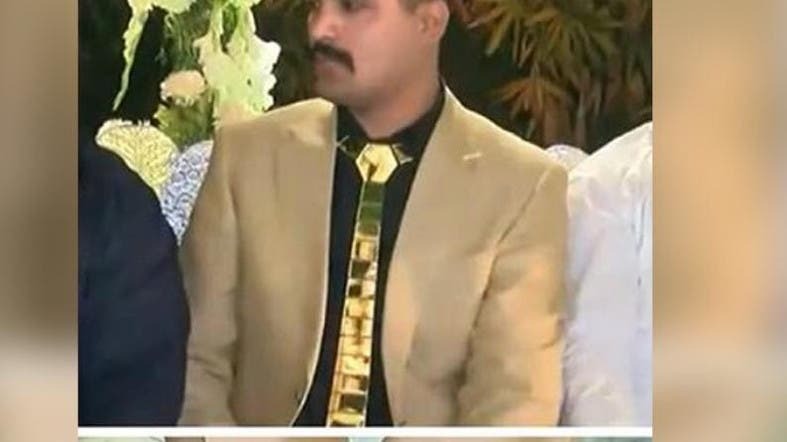 A groom in the Pakistani city of Lahore took opulence during marriage to an entirely new level when he wore accessories made in gold alongside his wedding outfit. In South Asian countries gold jewelry is usually used for weddings as accessories for dressing up the brides on their wedding day, but Hafiz Salman Shahid chose to wear gold, worth Rs 2.5 million, literally from head to toe. A #Pakistani #Desi #Groom based in #ValenciaTown #Lahore, #HafizSalmanShahid wore a #Valima #outfit worth Rs. 25 lakhs. His #suit cost, Rs. 63,000; his shoes with 32 tolas of #gold cost Rs. 17 lakhs & his #tie with 10 tolas #gold cost Rs. 5 lakhs with the #crystal embellishments on his #outfit worth Rs. 16,000! According to a report in researchsnipers.com, the groom Salman appeared in the reception in an outfit costing around Rupees 2.5 million, with shoes which were made of gold costing around 1.7 million rupees and a gold tie costing nearly around half a million. His suit was worth Rs 63,000 and had crystals and jewels embodied on it. Hafiz was provided with security guards. He said that he always wanted to wear something unique on his big day. He is the only brother of seven sisters and apparently his parents wanted to fulfil all their wishes on their only son, said the report.